Okay, maybe I am coming around to embrace the idea of zebra stripes. As many of you know, I am such a design and decor magazine junkie - but I had not seen this vignette until today. Zebra striped rugs, pillows, etc. are just not a new idea any more, I am kind of "over" the whole stylized look. But I might be changing my mind. 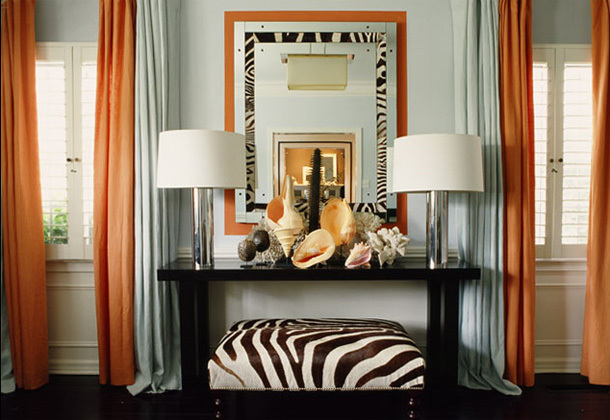 Love this mix from Mary McDonald,;blue, orange, silver glass modern lamps, and a completely gorgeous collection of specimen sea shells mixed with coral displayed so elegantly on a simple black lacquered console table. Somehow the zebra striped ottoman and mirror work perfectly! We are very excited about our new advertising partnership with Emily Clark Interiors, which is where I found this beautiful image. I think you will love her style too! So funny, I have this picture in my files and thought the same thing. To combine the two seems so far fetched..., but it works visually! Absolutely beautiful!!! I'd never have thought this would pair so nicely either.